RALEIGH, N.C. — Just days before the season began, Curtis McElhinney wasn’t even in the conversation about the Carolina Hurricanes. Now he’s emerging as the team’s top goaltender. He’ll likely have another chance to prove his worth Friday night against the visiting Anaheim Ducks at PNC Arena. Carolina goalies Petr Mrazek and Scott Darling are a combined 5-7-3 in 15 games. Darling, who was projected to be the team’s top goaltender this season, was placed on waivers Thursday. The Ducks, who’ve also won four of their last five games, will be in their fourth game of a season-long five-game road trip. 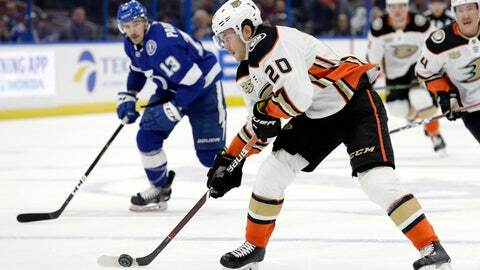 “You’ve got to feel good about ourselves a little bit, but we’ve got lots of room for improvement,” said Ducks coach Randy Carlyle, whose team won on back-to-back nights this week at Tampa Bay and Florida. John Gibson has been Anaheim’s primary goalie, though Ryan Miller has had success against Carolina, mostly as a Buffalo Sabres goalie. He owns a 16-9-4 all-time record vs. the Hurricanes. Miller moved into 17th place on the NHL career wins list with his 373rd victory when the Ducks defeated Tampa Bay. He’s within one victory of matching John Vanbiesbrouck for the most by a U.S.-born goalie. “She’s good luck, I guess,” left winger Nick Ritchie, who scored two goals Wednesday night at Florida, said in reference to his mother. The Ducks won both meetings last season with Carolina and hold a four-game winning streak in the series. They’ve won in their last four visits to Raleigh.